I finished a great book last weekend- Animal, Vegetable, Miracle by Barbara Kingsolver, check out the website HERE I had been wanting to read it for awhile, but somehow forgot about it until recently. The book is basically a journal of how the author and her family lived for one entire year on food that they either produced themselves or were able to get locally (within a 70 mile radius). They only ate foods that were ripe and in season and also provided great recipes. It is very inspiring to see how a family was able to do this by working hard and really being educated about where there food was produced and what went into it. I highly recommend this book and any of the recipes. This was one they came up with to use all the zucchini they had in the summer. It is light and filling at the same time, and so tasty. Thanks to Sarah, she posted about this book a few weeks ago and reminded me how much I wanted to read it. Bring 6 cups chicken stock to a boil and add pasta. Cook 8 to 12 minutes. 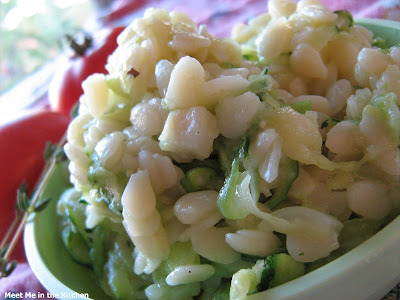 Use a cheese grater to shred zucchini, saute briefly with onion and garlic, until lightly golden. Add spices to zucchini mixture, stir thoroughly, and then remove mixture from heat. 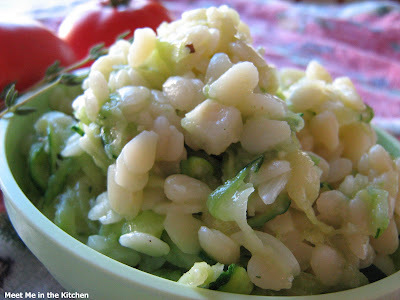 Combine with cheese and cooked orzo, salt to taste, serve cool or at room temperature. That book has been on my list forever. I'm just waiting my turn for my name to come up at the library. Can you really imagine doing that? I don't know if I could manage. Especially living where I do. My choices would be so limited. There would be no orzo to eat with my zuke for sure. I have that book MaryAnn. It was on our bookclub list at church, but I haven't gotten around to reading it yet. I really must!